Sleeping Beauties | Teefa Says.. There's something serene about watching a baby sleep. I bet all mothers would agree to this. But watching my two babies sleeping and cuddling like this night after night makes my heart bursts with happiness and gratitude. I love how Afif needs to hug or just hold Dhani's hand to help him fall asleep. 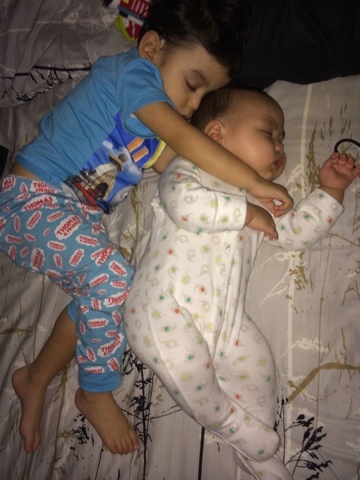 And i love how Dhani sleeps better with his big bro hugging him (tho he hates it when Afif gentel2 his fingers. Haha). Mama prays that you boys will have each other's back. Through thick and thin, baby.